This photo was taken on 31 December 1962 by the United Nations Temporary Executive Authority (UNTEA). It depicts the raising of an Indonesian flag alongside a United Nations flag in the territory that was then known as West Irian, but local inhabitants call West Papua. 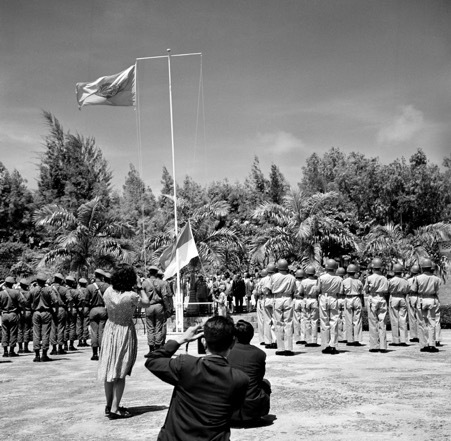 Just over a year earlier on 1 December 1961, a similar ceremony had taken place: the West Papuan ‘Morning Star’ flag had been hoisted with the Dutch flag to symbolize its future independence from Dutch colonial rule; West Papuans used the flag to represent their nationhood to the world – translating their desires for freedom and self-government into a form legible to the world and to the UN. These ceremonies signal how dramatically this territory’s fate had changed in just over a year. In this case the 1962 photograph featuring the UN and its flag hid an earlier attempt by West Papuans to gain UN recognition. In October 1961, a council of West Papuans had chosen the Morning Star flag to galvanize national feelings and express a unique Papuan identity. The 1961 flag-raising ceremony took place a few months later in December, signalling the efforts by a local community to stake a claim to independence in fulfilment of article 73 of the UN Charter relating to Non Self-Governing Territories. The West Papuan council declared the flag-raising day a public holiday and made an international statement calling on the world to support Papuan self-determination. The Dutch flag still flew alongside the West Papuan flag, marking Dutch support for West Papuan self-government, but also an unwillingness to relinquish the colonised territory. This was a moment of hope, but hope deferred. While Indonesia had gained independence from the Dutch in 1949, the future of Dutch New Guinea (West Papua) had been left unresolved. The Dutch had argued it was a separate territory and not part of Indonesia. The Indonesian nationalists were divided over this issue, some arguing West Papua was separate while others claiming the Indonesian Republic should be the successor to all the Dutch colonies. Papuan nationalists were not given the opportunity in these earlier disputes to represent themselves. Although West Papuans had been part of the administration of their territory, they were excluded from the negotiations between the Netherlands and Indonesia even when they resumed in 1961. Papuan leaders chafed at their exclusion from these discussions. Nicholas Jouwe, an elected member of the New Guinea Council and prominent Papuan leader, declared “Indonesia must recognise our right to live as an independent people”. Eliezer Bonay, a prominent politician and leader of the West Papua National Party (Parna), proposed a tripartite conference of Dutch, Indonesian and Papuan delegations to recognize West Papuans’ right to independence (South Pacific Post, Nov 3, 1961). However, no such tripartite negotiations ever occurred. In August 1962, the US-led New York agreement was struck between the Netherlands and Indonesia: the Dutch would leave Papua, the United Nations would take over temporary control and then Indonesia would administer the territory until the West Papuans could participate in a vote of self-determination – deciding whether or not to be incorporated into the Indonesian Republic. Papuan leaders were dissatisfied with this outcome and continued to fight for an immediate plebiscite to be conducted under UN supervision. The New York agreement that led to the moment pictured elided this history of exclusion. In October 1962, the United Nations Temporary Executive Authority (UNTEA) took command. The raising of the Indonesian flag alongside the UN flag in December became an outward symbol demonstrating the UN’s commitment to the transfer of the territory to the Indonesian administration, regardless of whether the New York agreement was honored. The events of 1962 suggest that the Indonesian government had conducted a successful international campaign to subdue opposition to its control and gain support for its anti-colonial platform against the Dutch. Around the same time as the flag-raising ceremony, West Papua was taken off the list of Non Self-Governing Territories. Unlike the Dutch, who were considered a colonial power, the future Indonesian administration was not legally obligated to prepare the territory for self-government and report on its progress. While the Indonesian government proclaimed this as a moment of West Papuan liberation, for Papuans this was the beginning of a new regime of colonization. Once the UNTEA was gone programs of transmigration and ‘Indonesianization’ began – Papuan government officials were replaced, Indonesian language was enforced in schools and West Papuan political and cultural expression, such as the use of the Morning Star flag, was banned. From an international perspective, however, Indonesia’s control of the territory was not yet solidified. The New York agreement foresaw a plebiscite to allow for West Papuan self-determination. By the time the UN-supervised ‘Act of Free Choice’ was held in 1969, Indonesia had made it clear it would only accept one outcome – the incorporation of West Papua into Indonesia. Indonesia negotiated the terms of the vote so only 1,022 representatives participated. The Indonesian government claimed West Papuans were too primitive to take part in regular elections and argued for the Indonesian method of musyawarah, in which a representative voted for their area and an outcome was decided through consultation. During this time, West Papuans wrote to the United Nations seeking their intervention into this situation - pleading for all adult West Papuans to be allowed to vote and asking for UN intercession to allow for freedom of political expression and political organisation. They explained the Indonesian system was not in line with their practises and they wished to participate in a democratic and fair vote. Leader Markus Kaisiepo even submitted a draft ballot paper for enabling illiterate Papuans to vote. In anticipation of the struggle at the UN General Assembly, Papuan leader Nicholas Jouwe organised tours around Africa to try and gain the support of leaders from independent African nations. While there was support for West Papuan independence from African leaders, Indonesia’s prominence in the Afro-Asian solidarity movement made it difficult for these nations to openly oppose their regimes. Prominent anti-colonial advocates such as India backed Indonesia by reshaping the debate as an issue of Indonesian national unity rather than West Papuan self-determination. Many African states were unwilling to back the Act as they believed it might undermine future decolonisation and lead to European colonists conducting similar ‘Acts’ in order to avoid or delay decolonisation. The UN ambassador for Togo spoke out against Indonesia’s portrayal of Papuan ‘primitiveness’ as an inadequate excuse for denying a people self-determination and against the UNGA’s earlier resolutions. The ambassador from Ghana suggested the entire population should be allowed to vote in an open and fair plebiscite in 1975 to ensure true self-determination was allowed. African leaders highlighted the hypocrisy of establishing the non-aligned movement with the explicit aim of opposing colonialism and then allowing Indonesia to set up colonial-style rule in West Papua. Eventually in November 1969, after debates over the Act’s legality, the UN General Assembly voted 84 to 0 to acknowledge the ‘Act’ with no amendments. There were 30 abstentions – 24 from African nations and the rest from Latin American states. Ultimately, the maintenance of peace and good diplomatic relations with Indonesia and its supporters won out. As the African leaders feared, this signalled a shift in the United Nations’ approach to decolonization. Historian Tracey Banivanua Mar has argued that this moment ‘solidified the departure of the United Nations programme for decolonization from many Indigenous Peoples’ own aspirations’ (Banivanua Mar 2016, 150). Each year, around the world, West Papuans gather on December 1 to raise the Morning Star flag – demonstrating their continuing commitment to West Papuan self-government. Often, these ceremonies are met with state-sponsored violence and flags swiftly removed. While the Indonesian flag continues to fly over the territory, many Papuans refuse to accept its rule until another vote is held and Papuans can participate in a democratic and fair vote for self-determination. Banivanua Mar, Tracey. 2016. Decolonisation and the Pacific: Indigenous Globalisation and the Ends of Empire. Cambridge: Cambridge University Press. Drooglever, Pieter. Trans. Theresa Stanton, Maria van Yperen & Marjolijn de Jager. 2009. An Act of Free Choice: Decolonization and the Right to Self-Determination in West Papua. Oxford: Oneworld Publications. Saltford, John. 2003. The United Nations and the Indonesian Takeover of West Papua, 1962-1969: The Anatomy of Betrayal. London: RoutledgeCurzon. Photo source: ‘U.N. and Indonesian Flags Raised in West New Guinea (West Irian)’ 31 December, 1962.